Triumphant school caterers are celebrating after scooping awards for providing top-notch food. Derbyshire County Council's tenth annual Secondary Catering Quality Assurance Awards recognise top quality service provided to schools by the authority's catering teams. Caterers are nominated by pupils, teachers or members of the authority's catering service management team and judged in action at their schools. They are assessed on the quality of food, service, food presentation, customer care, hygiene, health and safety and kitchen management skills. Schools in the secondary awards compete in 12 categories, including the main Derbyshire Secondary Caterers of the Year award. The Secondary Caterers of the Year award is given to the best team nominated in all of the following categories; trainers award, quality catering award, customer care, communicator of the year and support team of the year. 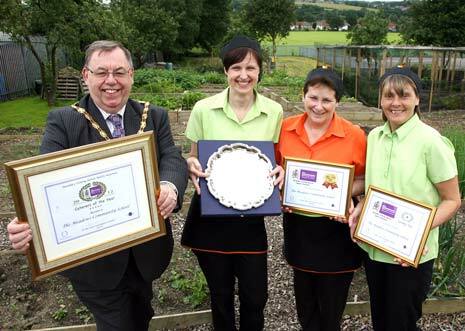 TOP NOSH: (from left) Councillor George Wharmby, Chairman of Derbyshire County Council, presents the 2012 Caterers of the Year award to catering supervisor Jeanette Kirk and catering team members Edith Smith and Michelle Ashby, in the school vegetable garden. 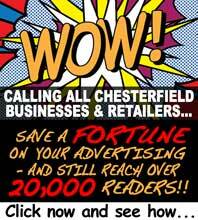 The Meadows Community School in Chesterfield are winners for 2012. Councillor Mike Longden, Derbyshire County Council's Cabinet Member for Education, said: "We take great delight in hosting these awards, as they celebrate and recognise the great achievements of the people who dedicate themselves to making sure Derbyshire's school children enjoy tasty and nutritious food. "I'd like to congratulate all the winners for the effort and innovation which has led to their success and high standards. "We are very proud of the quality of our school meals service and it is fantastic that The Meadows has triumphed against such stiff competition." Headteacher Lynn Asquith said: "I'm so proud of our fantastic catering team who have done really well to win this award. "It's a huge benefit to our school to have such wonderful school meals so students eat well and have good food, which helps them enjoy their lessons and be active, energetic and successful."